Today is the 100th anniversary of the start of the Battle of the Somme in which over a million people from 50 countries died in five months during the First World War. the British Fourth Army had 57,470 casualties, of whom 19,240 men were killed. the German 2nd Army lost 10,000–12,000 men. This is about the way the battle was recorded at the time by those who drew - officially and otherwise - and the conditions that they found while they were there. Those who drew varied. Some were or became famous. Others are little known. I'm guessing there are probably a fair few sketchbooks which never made it into official archives. 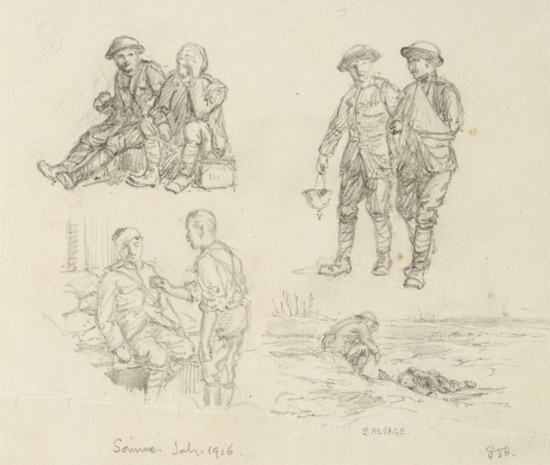 Muirhead Bone (1876-1953)- the first official war artist. He became an active member of the War Artists' Advisory Committee in the Second World War. 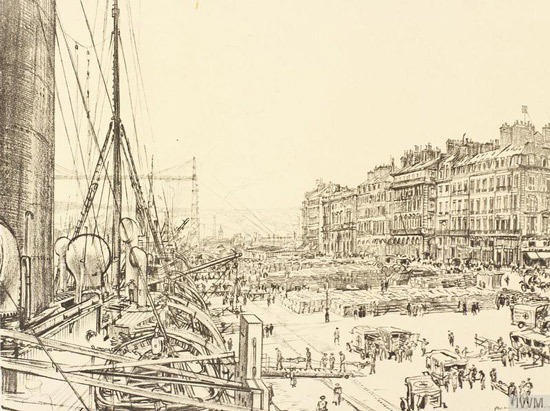 Bone was a draughtsman and etcher who had studied art in the evenings at the Glasgow School of Art and was a member of the New English Art Club. 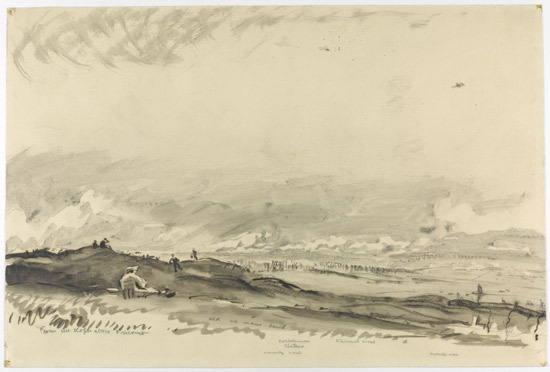 George Hoffman Spencer - an architect and artist whose estate bequeathed his sketchbook to the Imperial War Museum. It contains some 150 drawings. 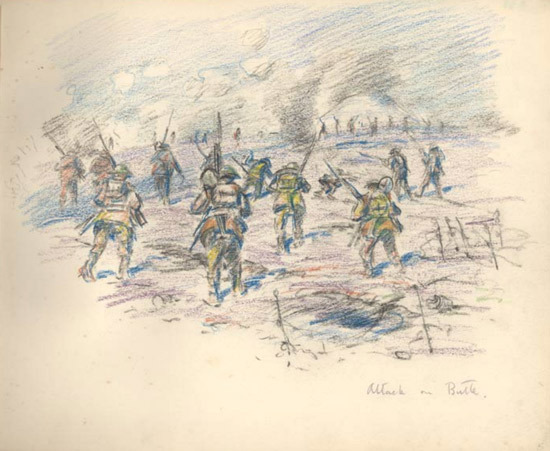 Captain Robert Mauchlen (1885-1972) drew a series of sketches during the war, including several during the Battle of the Somme. George Spencer Hoffman drew the soldiers who were exhausted or wounded and killed in the battle. EH Shepherd MC OBE (1879-1976) sketched his dugout in watercolour and the combat area around where he served. Our BC post copse B, near Maricourt Somme August 1916 E H Shepard Lieut. 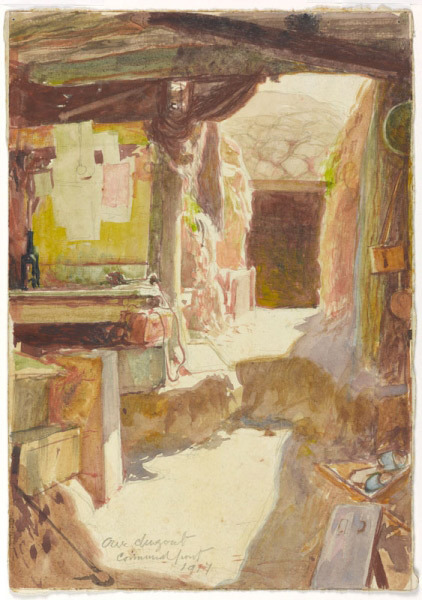 You can see more of EH Shepard's watercolour sketches from the First World War on the Imperial War Museum's website. Mametz Wood, Contalmaison Château, Fricourt Wood and Delville Wood in the distance. Villages, trees and people were all obliterated - and the artists continued to sketch and record. 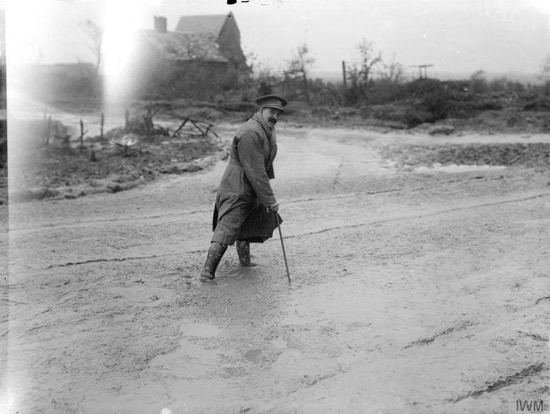 Contalmaison can be found about three miles north-east of Albert and around half a mile south of Pozieres, on the southern side of the main D929 road. The village was an objective for the 34th Division on the 1st of July 1916, but it took many more days of hard fighting before the 8th and 9th Green Howards of the 23rd Division were able to take it at 4.30 p.m. on the 10th of July. 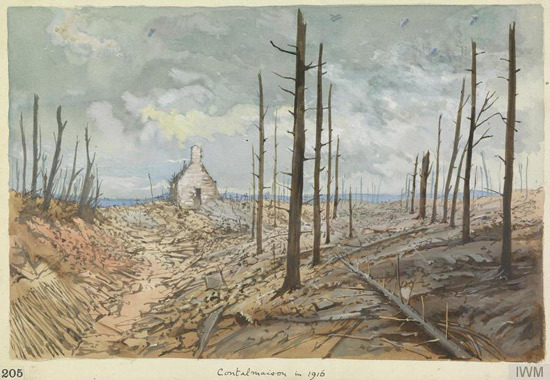 a view across the devastated village of Contalmaison, which has been reduced to piles of rubble and tree stumps, with only a single recognisable building visible. 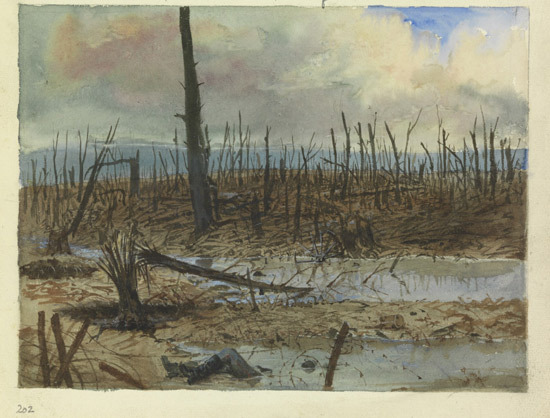 Mametz Wood: after the autumn advance, 1916.
a view across the devastated Mametz Wood, with splintered tree stumps and flooded shell holes. The body of a dead German infantryman lies in the foreground, the legs visible but the torso and head hidden by the water of a flooded shell hole. Then the wounded were brought home - first embarking on the ships. This is a lithograph by Muirhead Bone of the embarkation of the wounded which would have been based on sketchbook studies at the time. Muirhead Bone created a portfolio of 60 prints at the end of the war based on studies made while working as a war artist. Then they return home via London. A view of the exterior of Charing Cross railway station. 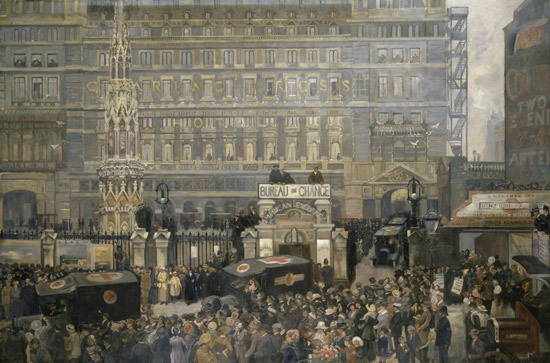 The Strand is lined with crowds of civilians watching Red Cross ambulances leaving the station. Outside Charing Cross Station, July 1916. There's something very special about recording an event which you witnessed. Fascinating article on some great war artists , for me one of the best First World War artist/ illustrators was Fortunino Matania wonderful artist , if it would have been possible to post some his examples I would have done.